CHI 2013 and GeoHCI workshop highlighted to me the importance of understanding media for maps. During CHI, the ‘Paper Tab’ demonstration used E-Ink displays to demonstrate multiple displays interaction. I found the interactions non-intuitive and not mapping very well to what you would expect to do with paper, so a source for confusion – especially when they will eventually be mixed with papers on a desk. Anyhow, it is an interesting exploration. E Ink displays are very interesting in terms of the potential use for mapping. 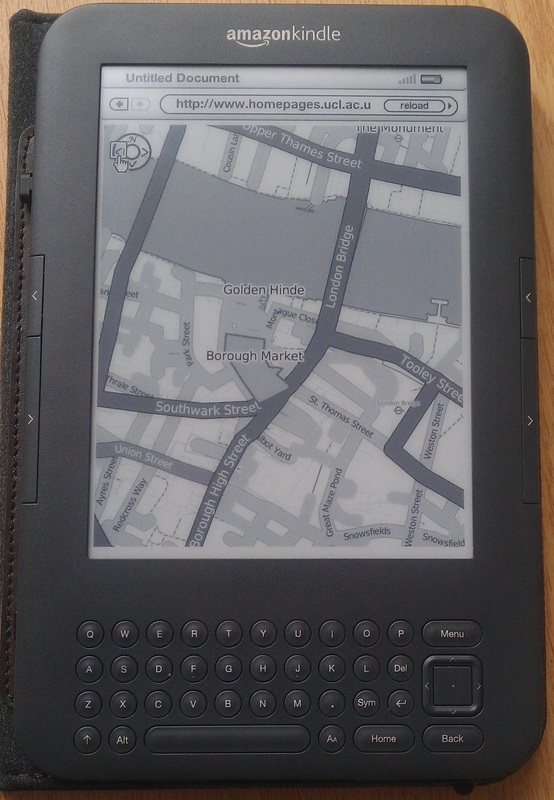 The image below shows one of the early prototypes of maps that are designed specifically for the Kindle, or, more accurately, to the E Ink technology that is at heart of the Kindle. From a point of view of usability of geographical information technologies, the E Ink is especially interesting. There are several reasons for that. First, the resolution of the Kindle display is especially high (close to 170 Pixels Per Inch) when the size of screen is considered. The Apple Retina display provide even better resolution and in colour and that makes maps on the iPad also interesting, as they are starting to get closer to the resolution that we are familiar with from paper maps (which is usually between 600 and 1200 Dot Per Inch). The reason that resolution matter especially when displaying maps, because the users need to see the context of the location that they are exploring. Think of the physiology of scanning the map, and the fact that capturing more information in one screen can help in understanding the relationships of different features. Notice that when the resolution is high but the screen area is limited (for example the screen of a smartphone) the limitations on the area that is displayed are quite severe and that reduce the usability of the map – scrolling require you to maintain in your memory where you came from. Secondly, E Ink can be easily read even in direct sunlight because they are reflective and do not use backlight. This make them very useful for outdoor use, while other displays don’t do that very well. Thirdly, they use less energy and can be used for long term display of the map while using it as a reference, whereas with most active displays (e.g. smartphone) continuous use will cause a rapid battery drain. On the downside, E Ink refresh rates are slow, and they are more suitable for static display and not for dynamic and interactive display. During the summer of 2011 and 2012, several MSc students at UCL explore the potential of E Ink for mapping in detail. Nat Evatt (who’s map is shown above) worked on the cartographic representation and shown that it is possible to create highly detailed and readable maps even with the limitation of 16 levels of grey that are available. The surprising aspects that he found is that while some maps are available in the Amazon Kindle store (the most likely place for e-book maps), it looks like the maps where just converted to shades of grey without careful attention to the device, which reduce their usability. The work of Bing Cui and Xiaoyan Yu (in a case of collaboration between MSc students at UCLIC and GIScience) included survey in the field (luckily on a fairly sunny day near the Tower of London) and they explored which scales work best in terms of navigation and readability. The work shows that maps at scale of 1:4000 are effective – and considering that with E Ink the best user experience is when the number of refreshes are minimised that could be a useful guideline for e-book map designers. Finally, after 2 years in the making, Interacting with Geospatial Technologies is out. It is the first textbook dedicated to usability and Human-Computer Interaction (HCI) aspects of geographical information technologies. It covers desktop, Web and mobile applications and how they can be designed so they are more effective, efficient, error-free, easy to learn and enjoyable, which is one version of the 5 E’s of usability. I started thinking about the book in 2004, when I realised that the most recent academic books dedicated to HCI and GIS were published in 1993 and 1995. These are respectively David Medyckyj-Scott and Hilary Hearnshaw’s Human Factors in Geographic Information Systems and the collection of papers from the NATO workshop Cognitive Aspects of Human-Computer Interaction for Geographic Information Systems, edited by Tim Nyerges, David Mark, Robert Laurini, and Max Egenhofer. While these books and the collections of papers in them are still valuable, it must be noted that in the early 1990s, Web-based GIS was just starting to appear, desktop GIS was fairly basic, mobile GIS was not even experimental and GIS trade journals argued about which UNIX workstation is the best for GIS. Apart from these books, the proceedings of COSIT (Conference of Spatial Information Theory) are also valuable sources of academic research on spatial cognition and other principles of geographical and spatial information, and there are also many papers in academic journals about GIS. However, not much attention was paid to everyday use of geographical information technologies, and no textbook included an introduction in a form accessible to postgraduate students and software developers. So, after complaining in various conferences that there is a clear need for such a book, I started working on it. It was an interesting process to identify suitable authors and encourage them to contribute to the book. While offering the breadth of several authors who specialise in different aspects of the field, I think the textbook is coherent and consistent, and its style both accessible and readable. The editing process was more active and time-sensitive than is often the case in academic books, to ensure that the textbook is usefully up-to-date. On UCL’s MSc in GIS, a recent course based on the textbook was well received by students. The book covers the principles and the practical aspects of interaction with geospatial technologies. There are sections about spatial cognition, cartography, user-centred design and usability engineering – here is the table of contents. So, now you can get your own copy – and any feedback is welcomed. The discussion about the future of the GIS ‘profession’ has flared up in recent days – see the comments from Sean Gorman, Steven Feldman (well, citing me) and Don Meltz among others. My personal perspective is about the educational aspect of this debate. I’ve been teaching GIS since 1995, and been involved in the MSc in GIS at UCL since 1998 – teaching on it since 2001. Around 1994 I was contemplating the excellent MSc in GIS programme in Edinburgh, though I opted to continue with my own mix of geography and computer science, which turned out to be great in the end – but I can say that I have been following the trends in GIS education for quite a while. Based on this experience, I would argue that the motivation for studying an MSc in GIS over the past 20 years was to get the ‘ARC/INFO driving licence’. I use ARC/INFO as a metaphor – you can replace it with any other package, but ARC/INFO was the de facto package for teaching GIS (and its predecessor ArcGIS is today), so it is suitable shorthand. What I mean by that is that for a long time GIS packages were hard to use and required a significant amount of training in order to operate successfully. Even if a fairly simple map was needed, the level of technical knowledge and the number of steps required were quite significant. So employers, who mostly wanted someone who could make them maps, recruited people who gained skills in operating the complex packages that allow the production of maps. The ‘ARC/INFO driving licence’ era included an interesting dissonance – the universities were telling themselves that they were teaching the principles of GIScience but the students were mostly interested in learning how to operate a GIS at a proficient level to get a job. I’ve seen and talked with enough students to recognise that many of them, in their daily jobs, rarely used the spatial statistical analysis that we were teaching and they mostly worked at ‘taming the beast’, which GIS was. As expected, at UCL there was always a group that was especially interested in the principles of GIScience and that continued their studies beyond the MSc. But they are never the majority of the cohort. The model worked well for everyone – universities were teaching GIS by a combination of principles and training of specific packages and the students found jobs at the end and joined GIS departments in different organisations. The disruption that changed this arrangement started in the late 1990s, with Oracle Spatial starting to show that GIS can be integrated in mainstream products. The whole process accelerated around 2005 with the emergence of GeoWeb, Free and Open Source GIS (FOSS GIS) and the whole range of applications that come with it. Basically, you don’t need a licence any more. More and more employers (even GIS consultancies) are not recruiting from GIS education programmes – they are taking computing professionals and teaching them the GIS skills. Going through an MSc in GIS to be proficient with a tool is not necessary. So in an era in which you don’t need a licence to join the party, what is the MSc in GIS for? The answer is that it can be the time when you focus on principles and on improving specific skills. Personally, that was my route to education. I started working in GIS software development without much more than high school education in 1988. After hearing people around me talking about registers, bugs, polygons and databases I was convinced that I must understand these principles properly. So I went for a degree that provided me with the knowledge. In the same way, I would expect that MSc programmes cater for the needs of people who gain some practical experience with operating geospatial technologies and want to learn the principles or become specialists in specific aspects of these systems. We already see people doing the MSc while working with GIS – currently studying an MSc by distance learning or in the evening is very popular and I expect that this will continue. However, the definition of what is covered by GIS must be extended – it should include everything from Bing Maps API to PostGIS to ArcGIS. I can also see the need for specialised courses – maybe to focus on the technical development of geospatial technologies or maybe on spatial statistical analysis for those who want to become geographical information analysts. I would also expect much more integration of GIS with other fields of study where it is taught as a tool – just look at the many MSc programmes that currently include GIS. I’m already finding myself teaching students of urban design, development planning or asset management. All in all, I’m not going to feel sorry that the ‘ARC/INFO driving licence’ era is coming to its end. UPDATE: a more detailed version of this post appeared in Cartographica, and can be accessed here or email me to receive a copy. The AGI GeoCommunity ’08 is over – and it was a great conference. Building on the success of last year, the conference this year was packed with good papers and with 600 delegates. I found the papers from Joanna Cook, of Oxford Archaeology, about the use of Open Source GIS as the main set of products in a business environment, and from Nick Black, of CloudMade, on Crowd Sourced Geographical Information especially interesting. What is especially good about the AGI in general, and the conference in particular, is that unlike other forums that cater for a narrow audience (say mainly neogeographers in Where 2.0, or academics in GISRUK), the AGI is a good forum where you can see vendors, commercial providers, veterans and new users all coming together to talk about different aspects of GI. Even if they disagree about various issues such as what is important, having the forum for the debate is what makes this conference so valuable Just look at the blogs of Ed, Adena, Joanna, Andy and Steven for such a debate to see that there are issues that people will argue about quite fiercely – which is a sign of a great conference. I’m especially pleased with the success this year of bringing in people from the academic community who presented papers and attended the conference. This interaction is very significant as, through our teaching programmes, we are actually training the people who will join this crowd in the future, and we should keep an eye on the trends and needs of the sector. For example, one of my conclusions from the conference is that the existing ‘business model’ of the M.Sc. in GIS programmes, which was, inherently, ‘we’ll train you in using [ArcGIS|Mapinfo|other package] so you can get a job’, is over. The industry is diverging, and the needs are changing. Being a GI professional is not about operating a GIS package. We should now highlight the principles of manipulating geographical information, and, as Adena Schutzberg commented during the debate, train people how to ask the right questions, and to answer the most important ‘So what?’ question about the analyses that they are producing. We should also encourage our students to participate in forums, like the AGI, so they continue to learn about their changing world.